Cistern and Ramp are the westernmost of the four pairs of narrow canyons along the south edge of the San Rafael Swell, where the cliffs of the reef are at their highest, and the strata most upturned. This means the narrow parts are relatively short, since the slot-forming Navajo and Wingate sandstone layers are encountered for only a short distance, and the canyon floor is angled relatively steeply. 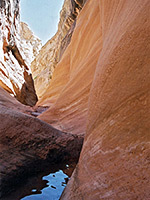 Unlike the other ravines, these two are not easily reached from the south, by the short road from Goblin Valley State Park, and instead need an approach from the north, by a drive of over an hour on less-traveled, unpaved roads ending near the old Hidden Splendor Mine beside the Muddy River. 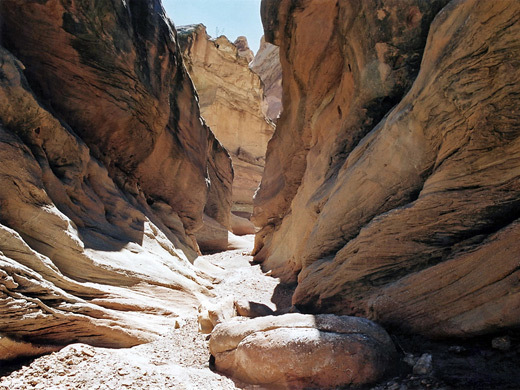 Ramp Canyon is the first breach through the San Rafael Reef east of the Muddy River - about 3 miles east - while Cistern Canyon is parallel to it and 1.5 miles further. Both are usually dry, though Cistern has an intermittent spring at its mouth and may have a small creek flowing through, which south of the reef forms Hunt Draw, and joins the Muddy River several miles downstream. The two main driving routes to the canyons start from the north - exit 131 of interstate 70, or from the east - the paved road to Goblin Valley, and are also used to reach the trailhead for the hike down the Chute of Muddy Creek. The roads are good all the way, just a little rougher and steeper once after the turn off to Tomsich Butte, where the surroundings change from mainly flat, open grassland to a barren expanse of red, weathered rock, with pinnacles and ridges to one side and high cliffs to the other. There are plenty of possible campsites at roads end, a large level area with an airstrip and various relics from the Hidden Splendor uranium mine which ceased operations in 1957. This place feels especially remote and desolate, especially if camping alone. The trailhead for the hike is 2.5 miles back up the road - a rough track branches south, leading towards the start of Ramp Canyon though this is for high clearance vehicles only, so others will have to park beside the main track. 9 views of Cistern and Ramp Canyons. TopoQuest topographic map of Cistern and Ramp Canyons. The two canyons can be descended in either direction, and Ramp is probably easier to go up than down, but this description is of the alternative route. The rough track passes an abandoned blue car, and the start of a path used to reach nearby Quandary Canyon, then descends into the Ramp Canyon drainage, where the regular route ends, though ATV tracks continue. This point is just outside the boundary of the Crack Canyon Wilderness Study Area. 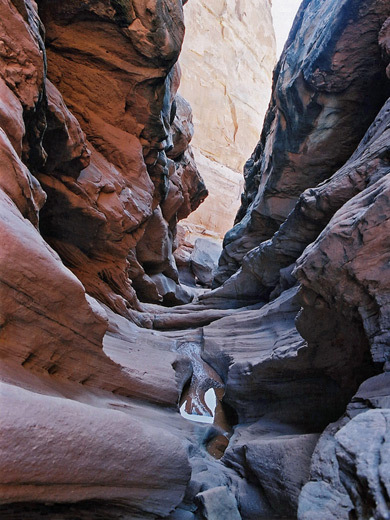 Downstream of the road, the wash soon enters its canyon, starting with a short stretch of Kayenta narrows, then meets the Navajo layer, where a large chokestone and a 25 foot drop create the one main obstacle in this canyon. This can be passed by climbing down the slope on the west side, descending along a narrow inclined ridge, but the exposure means that for all apart from accomplished climbers, a rope is needed. There may be another route down through a hole underneath the boulder, but again only with aid of a rope. The sheer canyon walls prevent any easy bypass routes, so the only other way to progress is to walk back almost to the mouth of the canyon, then on the east side, climb the cliffs and ledges up to the top of the reef and contour down the less steep slope on the far side, rejoining the canyon at the lower end. Below the 25 foot drop is one other obstruction, a high dryfall, passed more easily by climbing up and around, and some short narrows. On the far side of the reef, the main rocks give way to a labyrinth of badlands, mud hills and small washes, and further south, a series of red ridges and more upturned strata which in the far distance fade into a barren plain with isolated mesas - the edge of the Upper Blue Hills near Caineville - all of which create a particularly strange, prehistoric-looking landscape. Cistern Canyon exits the reef only 1.5 miles from Ramp but the uneven terrain makes the walk longer then expected, and the entrance may not be easy to find, though the exit wash is much larger then any other in the vicinity. 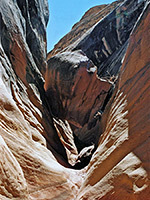 The drainage at first cuts through hills of conglomerate then soon meets the Navajo sandstone layer, via a short narrows section that may harbor several muddy pools, and ends with a huge boulder wedged in the streamway. 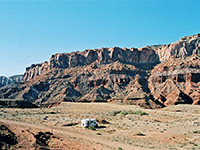 The middle part has more large boulders, and ascends more steeply through the Kayenta strata with one other short confined channel, though none of this canyon is particularly narrow. Once back inside the reef, the return route to the trailhead is along an old mining track that approaches from the left, starting with a long, steady climb uphill for 1.5 miles. The track is partially washed away in places but is still used occasionally by ATVs, gives good views over the colorful rocks inside this part of the reef, and passes some areas of petrified wood near the summit. After here it drops more steeply down to Ramp Canyon and meets the road to the trailhead.